This bathtub rail has three convenient gripping areas to make getting into and out of the bathtub easier. Each gripping area has a textured finish. Chrome finish inhibits rust. 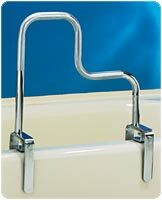 Tri-Grip bathtub rail has three convenient gripping areas to make getting into and out of the bathtub easier.